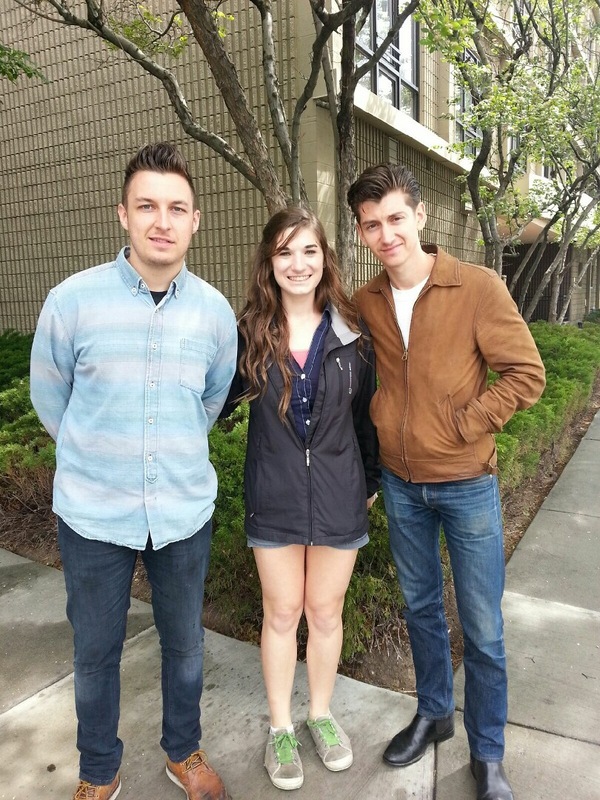 Last night I attended the Arctic Monkeys’ Boise, ID show at the Knitting Factory. Drove 8 hours from Oregon to go and it was SO worth it. I’ll start from the beginning of my day. My sister and I planned on hanging out the whole day in downtown Boise since it was a Sunday and we had no other plans. We got downtown around 2:30 (the doors opened at 7, concert started at 8). As we were driving around, we saw two huge tour buses. We didn’t think they were the Monkeys’ until we saw a piece of paper in one of the windows with their logo on it. Although my sister wanted to go knock on the door, we didn’t. We just drove on by but kept our eyes peeled for seeing them around town. We went to the Record Exchange and I bought a few new CD’s (The Airborne Toxic Event’s Such Hot Blood, Oasis’ Heathen Chemistry, and Brandon Flowers’ Flamingo- all which have been on my “to buy” list for a long time). We kept our eyes open, but we didn’t see them anywhere. Then we decided to walk to the venue and grab some food along the way. We had to walk by their buses again to go to the venue. The fan girl inside me was flipping out and hoping that they might step out of something, although I thought I would be so starstruck that I probably wouldn’t even be able to say anything. We passed the buses, they weren’t nearby, then we were a couple block away and we saw two well dressed guys walking towards us on the other side of the street. My sister was convinced it was Alex but I was doubtful because I couldn’t see them that well and really, what are the odds? It’s not like we had been waiting outside their buses; we had just walked by once. They both said “sure” or something like that. They didn’t talk much- or if they did, my internal monologue of OHMYGOSHOHMYGOSHOHMYGOSHOHMYGOSH was blocking out all sound around me. I took my sister’s picture with them first. My hand was shaking so badly from excitement that I was afraid the picture would be blurry, but it was perfect. Then it was my turn. Here is the picture! They were super nice and willing to take a picture. The only thing I said to them was “we’re going to your show tonight” when we first saw them and when they were leaving I said “I can’t wait for tonight!”. Then according to my sister they said “see you later” but I don’t really remember. I just remember their accents were beautiful and I felt like I was going to die from over excitement. I was also in denial the whole time- I kept thinking “is this really them, these are probably just random guys we mistook for them” but my sister kept reassuring me that it was them. Of course it was them, I know, but it seemed too good to be true. This was my first time meeting a band since 8th grade when I met the Christian rock band Hawk Nelson. Needless to say, I think this was the most incredible experiences I’ve ever had. It really was just about being in the right place at the right time. I’m pretty sure they were heading back to their bus to go do sound check because we got in line at the venue shortly after and we heard them warming up with “R U Mine”. Part Two: The Concert Experience will be coming soon when I have time to write about it. I figured this experience was worthy of its own post and I am so excited about this that I want to share it with everyone!